ST Mastery student Alison Klee from the USA passed Liberty 1 with her mare Kestrel and with that Touchstone, she passed all 5 Touchstones in Grade 1 in the ST Evaluation Program! “Kestrel and I met in May of 2011. I was looking for a young tall warmblood that I could do dressage and maybe jumping or eventing with and Kestrel fit the bill. She was a beautiful 16.2H green broke mare. Her mother was a Swedish Warmblood show jumper and her father a racing Thoroughbred. 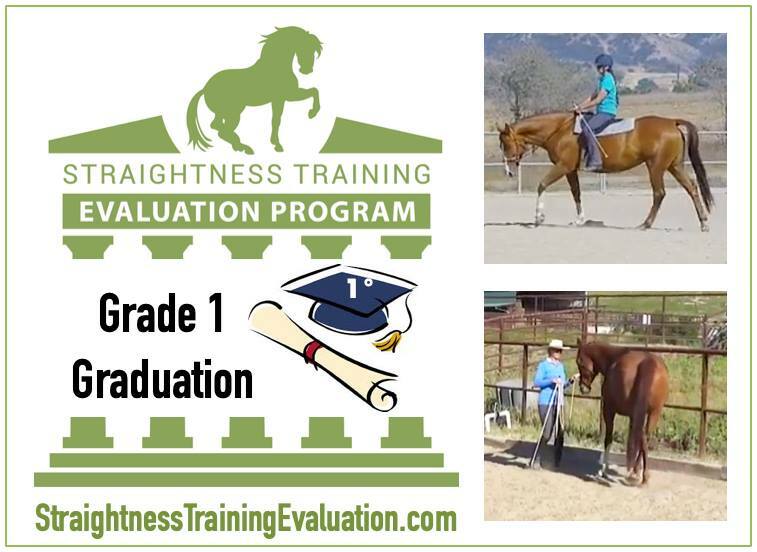 I am a Parelli student and I was looking forward to taking Kestrel, as my second horse, through the program. Unfortunately not long after I got her she had a traumatic injury to her sacroiliac (SI) joint. Playing in the ring, she had a bad fall and skidded about 10 feet sideways on her pelvis, dislocating it. So we made it to Level 4 Parelli but not without a lot of lameness issues. I was not able to work her consistently. Every time we would seem to be getting somewhere, she would have a flareup to her injury and need time off. So it was a lot of off and on again training. Plus being an LBE (left brain extroverted mare), she was a hyper-alert, spooky, dominant hothead who took after her racehorse daddy and time off certainly didn’t help her mentally. So I had to change my goals of having a show horse since I couldn’t really do the training with her that she needed to be a show horse. She had a very uneven trot, a very stiff back, her canter felt horrible and she wasn’t strong enough to maintain it. I love groundwork and liberty so when a notice for the Mastery Program came up in my FB page and coincidently Meg Brauch was giving a clinic in my area, I signed up for both. I thought that ST would at least be good to do especially if Kestrel was lame, I could at least do the walking stuff with her. And deep down I hoped that it would help her be stronger and more supple. Well, Meg’s clinic was eye-opening and I got it! This was what we needed. Our Grade 1 journey has been amazing. It is not always easy. I have been all over the ST Pyramid, getting lost, going in circles, and struggling to find my way back to the path, and am constantly all over the 6 stages of the Mastery Process. I have been very frustrated at times but the journey has been priceless. I am becoming a more knowledgeable and effective trainer. I love reading about the old masters, watching the videos, and delving into the purpose and essence behind the exercises. As a result, Kestrel has improved in all 3 gaits, her SI joint that was 1 inch (no exaggeration) displaced is now symmetrical. She is lighter, stronger, and more relaxed. We had the best canter ever the other day. She still lacks strength cantering to the left but she was balanced, even and comfortable. I attribute all of this improvement to ST.